The Commodore Vic20 was my first computer. I was 10 years old and I started learning CBM Basic V2, beginning what would later become my job. The programs back then were pretty simple, but without the internet, getting the needed documentation wasn't trivial (even though the commodore documentation was pretty good). Recently I've revived my old computer, after 25 years of inactivity, and found out it worked pretty fine. Just by adding a composite video cable and an SD2IEC adapter, I was able to start programming again, like in the good old days! But with the added help of internet documentation and forums, the sdcard instead of floppies, etc. 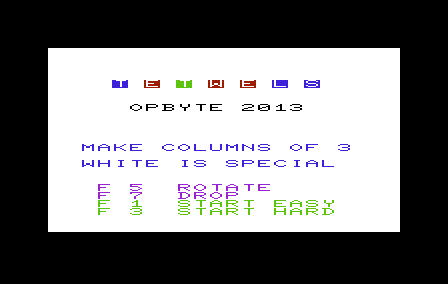 In this page I will link the games and possibly programs that I'm going to write for the commodore Vic-20. As you would have already guessed, it's a mix of Tetris and Jewels (or Columns or whatever). 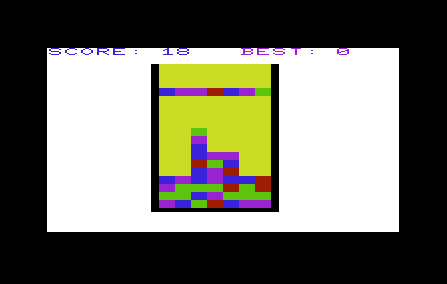 In this game you should pile 3 blocks of the same color. You can rotare the falling bar and drop it in order to speed up. Try to keep the board clean so it doesn't fill up to the top, or the game will be over. The game is made of a board divided into 10x10 squares. Goal of the game is to fill as many squares as possible. You can move horizontally and vertically by 3 squares or diagonally by 2. To move use the left side letter keys. The game ends when no more moves are possible. A variant of the game is to try to end filling as few squares as possible, such as 20.